Developed and published by Dream Reactor. Releasing on February 1, 2016. Available on PC (reviewed). Review code provided by publisher. Some days, it feels like the cards do what they do out of spite. They're cruel, vicious little things, that hide their true natures behind colorful card backs, but ultimately intend to spite the deck owner at any given opportunity. A bad day, with a bad hand, can feel like there's no recovering. For players unfamiliar with the trappings of the countless other trading card games, Spellweaver is a game in which two players independently assemble decks of cards to combat their opponents. Cards are broken down into spells or items of various types, from creatures who attack, to spells that deal damage, to artifacts, items, and enchantments that trigger various effects depending on the layout of the playing field. Each card is meant to have some effect on the battlefield, either helping the card's player or hindering their opponent. 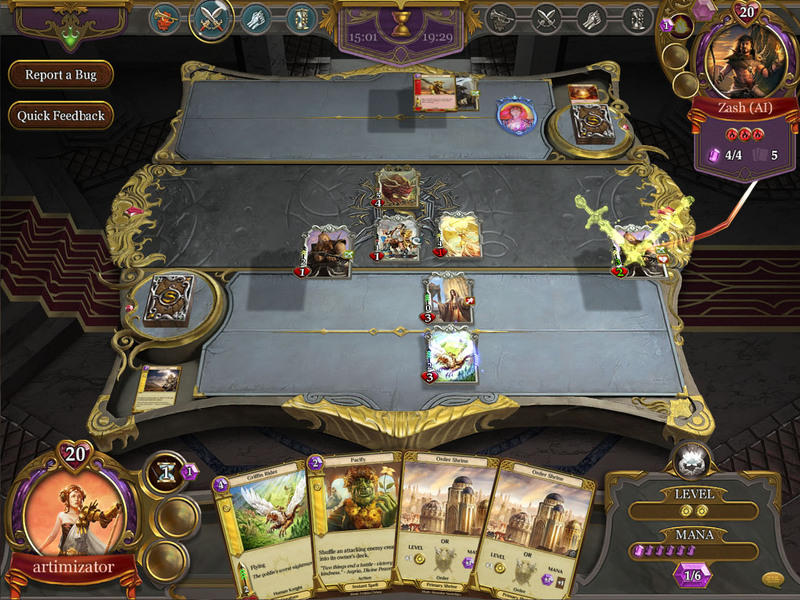 Each player takes turns drawing new cards from their decks, then attacks or uses spells in an attempt to whittle the other player's health to zero, which signals the end of the game. Each of these decks is hand built by the player, assembled from a spattering of random cards gained from pre-packaged "booster packs," in which there are between four and ten random cards. 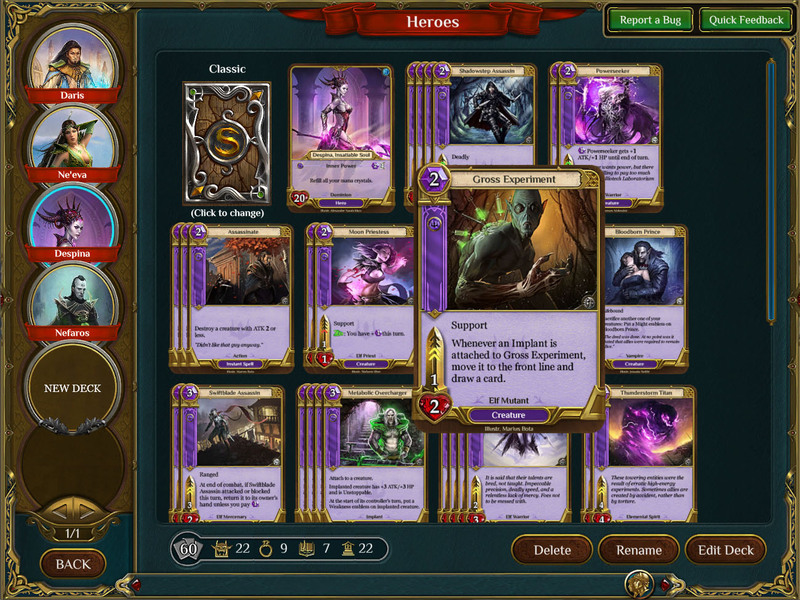 Each of the cards has a set cost, which is paid using resource cards the player must also include in their decks. 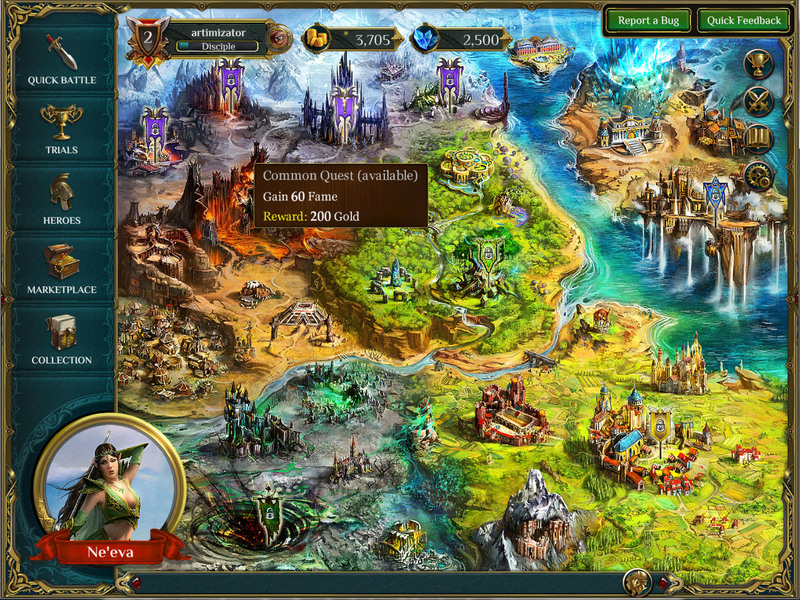 These resources are drawn and played during the course of the game, giving each player time to steadily develop their cache of cards, which in turn raises the scale of damage and abilities as the game goes on longer. This is a formula that matches many existing trading card games, from Magic the Gathering to Hearthstone to the Pokemon Trading Card Game. As for what Spellweaver does differently than the others, there isn't a great deal to say. Unlike games like Magic that make their resource cards color coded, Spellweaver has two different requirements on each card. Mana is colorless, and once collected, can be used regardless of element. However, in addition to mana cost, there's also a level requirement, which is coded to certain elements. These elemental levels can only be gained by shrines of that element. 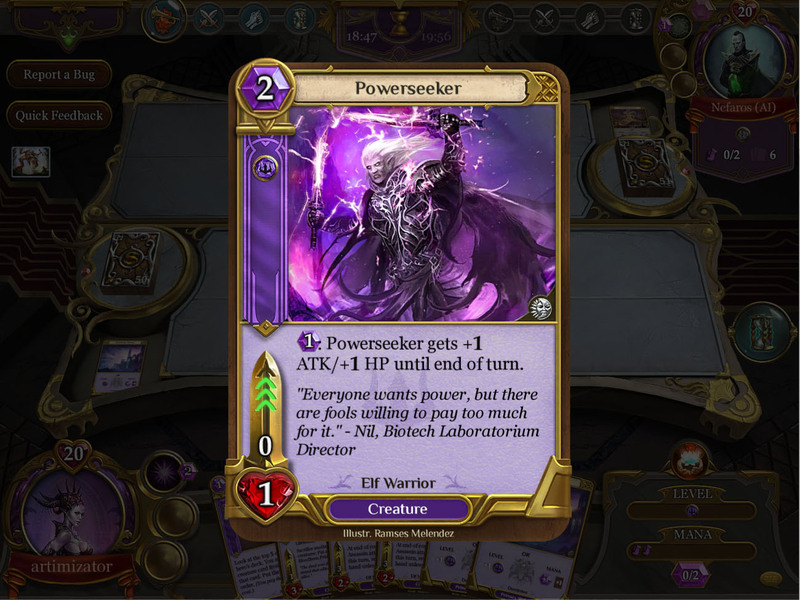 This means that, similar to Hearthstone, there is no colored mana, but there are still elemental requirements tied to the player's hero instead of to the cards on the field. 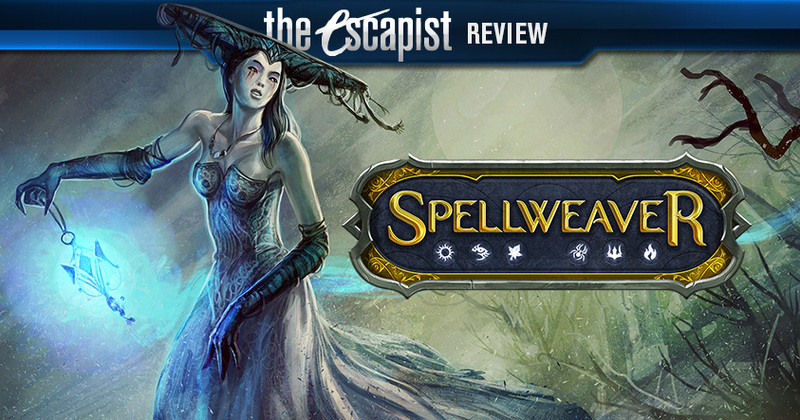 Spellweaver's biggest strength is perhaps that it is so much like other games in its genre. There are also hero abilities, which grant the player the opportunity to active effects with various level requirements, a mild mana cost, and a cool down to set the rate of how often the hero skill can be played. These abilities can either be gained from special types of the resource cards, called Shrines, or is the natural power of that deck's chosen hero card. Heros are tied to certain element levels, meaning a chaos (red) hero on an otherwise exclusively order (white) deck would render that hero's abilities pointless. Given that the heroes all have identical health otherwise, while it does introduce a tiny amount of diversification into deck building, the heroes feel arbitrarily included, rather than feeling like an integral part of a deck's grand strategy. More so given how mundane each of the heroes' skills are, though that might be to discourage too much power out of a hero if a player gets an early mana lead. Unlike Magic the Gathering, which is Spellweaver's closest cousin in the TCG genre, there are options for players who end up without enough shrines in their starting hand. In typical card games, this would just grind that player's progress to a halt. 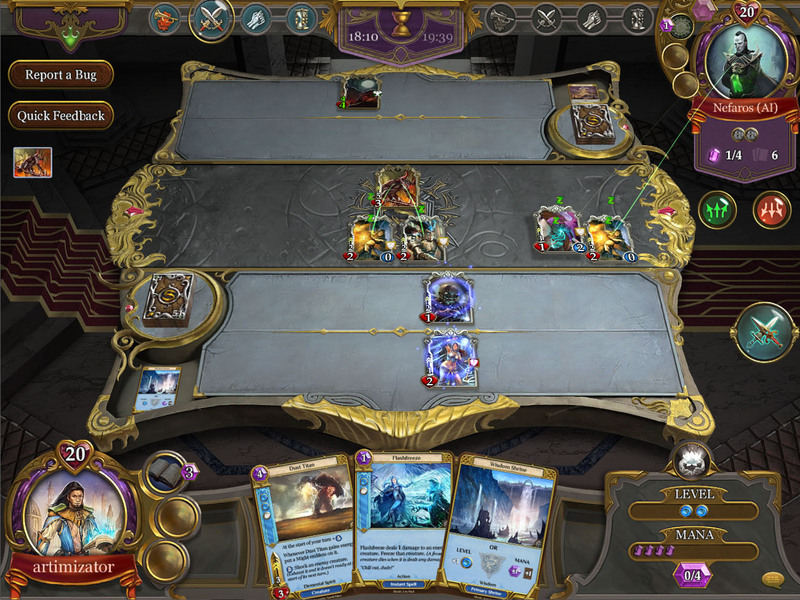 Spellweaver has an option to look at four cards from their deck, and if any of these cards are shrines, they can be put into the player's hand. The remaining three cards are put in the bottom of the deck. 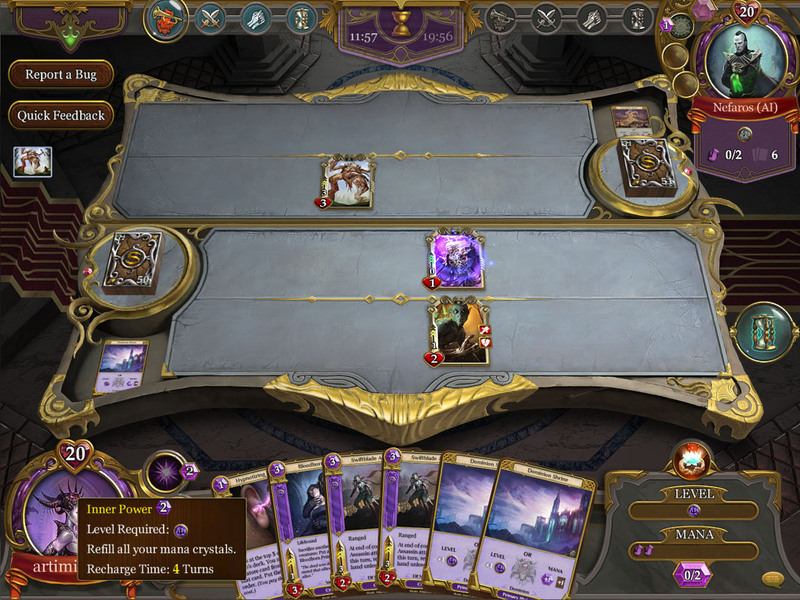 If none of the four cards are shrines, all four are put at the bottom of the deck, potentially burying good cards to oblivion, but giving the option for players who couldn't otherwise get resources. 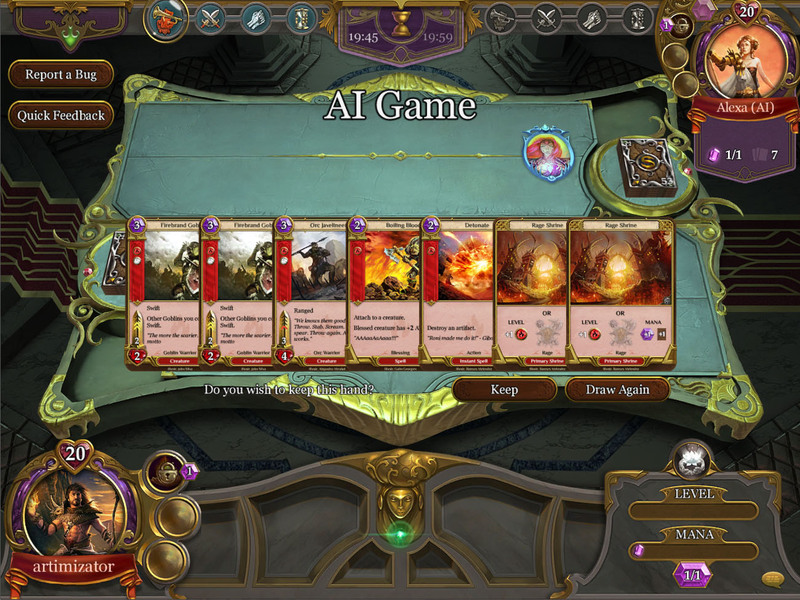 As a digital game, Spellweaver also gives players a good set of visuals without really bogging down games with overly elaborate attack or spell animations. 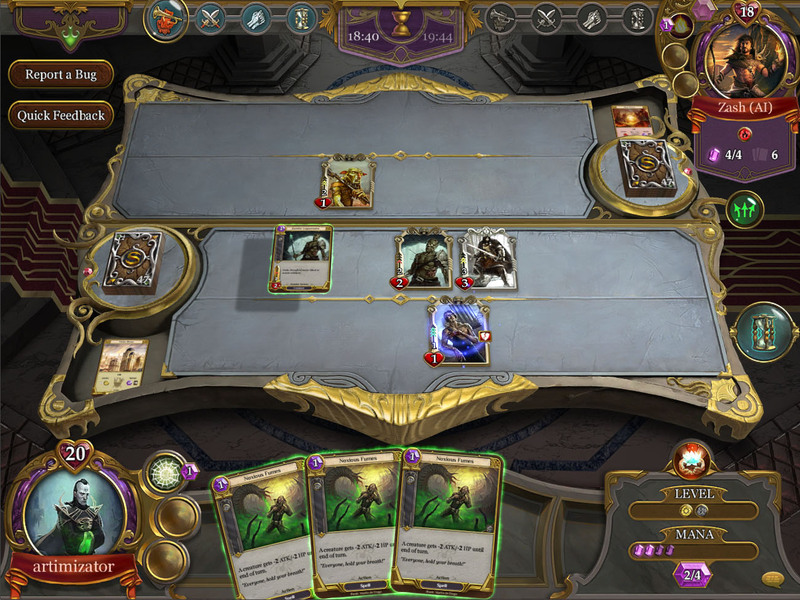 The interface is very clear, the game gives bonus money and booster packs at certain levels, and inquisitive players have tools to see cards' effects, even when turns are cycling quickly due to quick spellcasting. For what is effectively a physical game set to a digital space, it all works. The booster packs feel exactly like picking up a box at a local game shop, and comes with the same mind-numbing frustration when opening two or three packs in a row only to get cards that come in an element that's uninteresting or unhelpful, or a profoundly useful rare in an unplayed color. Likewise, the cost of really digging into the depths of the game to summon the rarer and stronger cards feels like a crap-shoot, requiring the player to put down more dollars or more effort to unlock the chance at cards that can push their decks further or give them more strategies within a single deck, in case a pivotal card gets knocked out early. Unfortunately, due to being a fledgling digital game, Spellweaver falters a little bit. 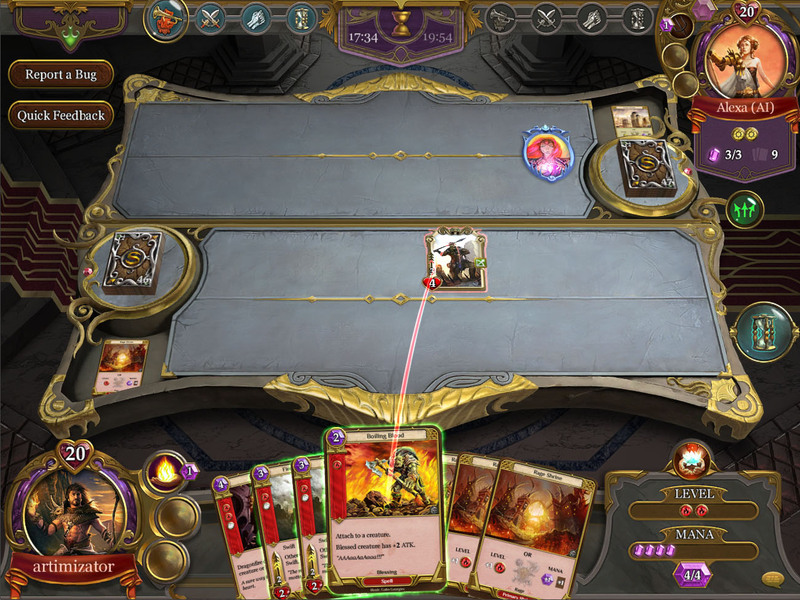 Although the deck building is robust, players have only basic one-on-one matches against opponents, in ranked and unranked flavors for online play, and organized tournaments that happen at certain days. Compared to things like Magic's Commander or Archenemy game modes, it means that while there's plenty of deck variety on display, the actual gameplay can start to feel formulaic for people who don't have a mind to dig into the exhaustive particulars. It likewise offers no campaign mode, meaning players who want a more single-player minded experience will have to live with playing against human or AI opponents in skirmishes with no narrative arc. Really, though, Spellweaver's biggest strength is perhaps that it is so much like other games in its genre. 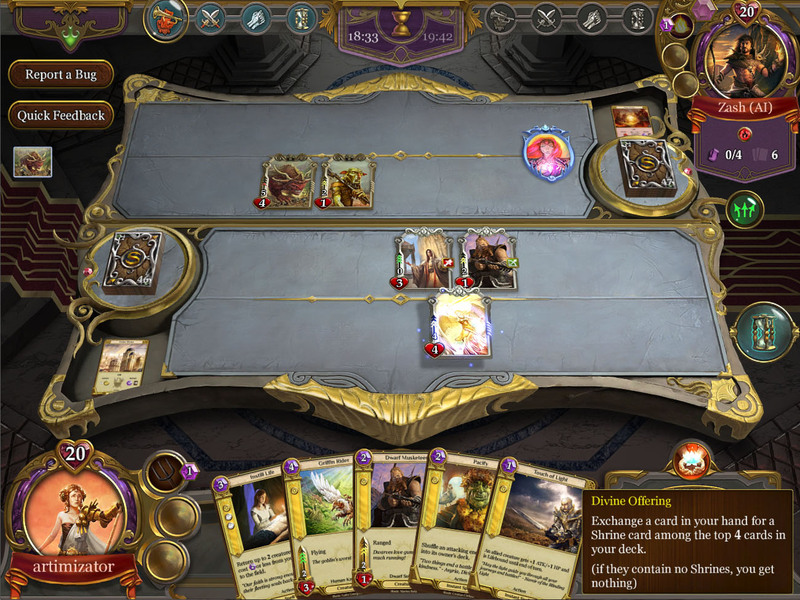 The deck-building in the game is robust and clear, which gives players the opportunity to customize every aspect of their deck. A gutsy player can pore through the card choices, wikia entries, and collections of decks online to develop new strategies and keep up with the competitive meta that ebbs and flows with any highly competitive trading card game. However, its biggest strength is also its main weakness. It is a very good version of a familiar game. The card art is beautiful, the user interface is crisp and clean, the booster packs are frustratingly realistic, the deck builds are flavorful and diverse, and it all feels a great deal like card games most genre fans have played before. It's an excellent take on the trading card game, digital or otherwise, but given that it's competing in a very well established place, it might not do enough to develop a huge audience. Recommendation: Fans looking to shake up their digital Magic the Gathering or Hearthstone routines will probably find something familiar, but likeable. New players looking to dip their toes in trading card games have the opportunity to dig in a little without huge out of pocket costs, but won't find much outside what they could get at the gaming table of a local game shop.